Now creating sign up sheets personally is not much difficult task because here you can get wide variety of sign up sheet templates loaded with editable features and useful for all organizations, clubs and training centers etc. data collection of prospects, volunteers or other persons can be difficult for you if you are not using a proper format or sample such as sign up sheet. Sign up sheets are documents usually used for registration of prospects, volunteers and people who want to join a club, organization or society etc. Well made sign up sheet provides its users a proper way to get all essential details about persons interested in registration for a nonprofit organization or club. Sign up sheet sounds like a best data collection tool when it comes to find people for a nonprofit activity or good cause. For example, as a manager of the nonprofit organization you may need some volunteers to get a particular nonprofit activity accomplished with help of them and a volunteer sign up sheet will provide you and volunteers a way to communicate details with each other. Volunteers can fill in the blank fields of sign up sheet with their names, contact details, email address and nature of work that they can perform for you. After that you as the manager can look up best and fit volunteers for the activity using available details in the sign up sheet. Sign up sheet can be a document prepared manually on simple paper with vital fields and spaces or can also be a printed document prepared on computer. Aside from the purpose of sign up sheet you want to make, feel free to download and customize our sign up sheet templates to create custom sign up sheets for personal or professional use. 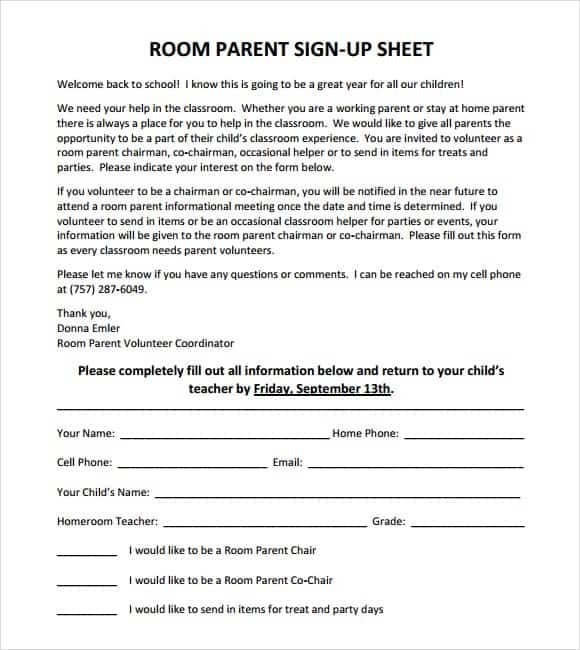 Lots of sign up sheet templates are available below for free.